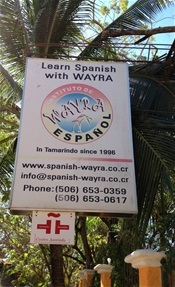 In a sun dress and sandals, I walked down the dirt road toward my first day of Spanish class. A huge matapalo sits at the corner of my house and then the landscape gives way to jungle-like woods on either side of the road. A thousand sounds kept me company as a I walked: insects buzzing, chirping, whistling, singing; birds whose songs I have never heard; dusty, parched leaves rustling in the breeze; a distant hammer somewhere to the south. The howlers are quiet this morning, the road empty except for me and my thoughts and my ever present notebook. My new teacher talked slowly and clearly, correcting my verbs and prompting me to reach for words I learned decades ago in intermittent Spanish classes. On the way home, the matapalo was covered in monkeys, many of them with babies on their backs, swinging from leafless limb to leafless limb, twirling acrobatics against the blue sky in a show that filled me with the wonder of being here.